We’re almost at the end of May and have some more updates about our #DrinkOne Boston Marathon victim campaign. 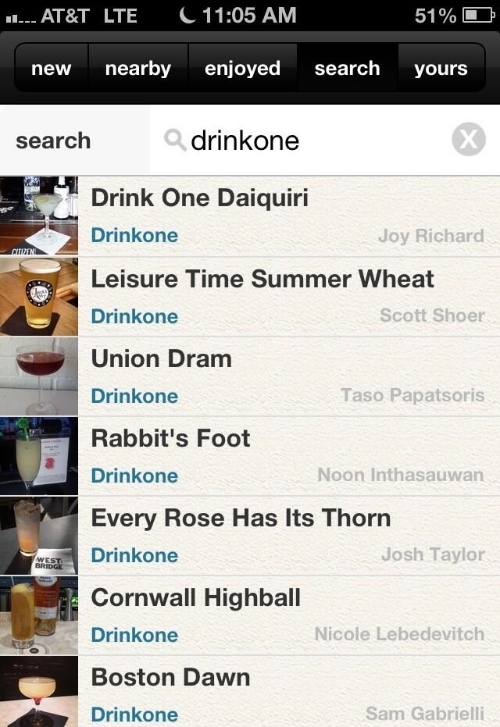 Remember: The boys of onthebar have made it super easy to find all #DrinkOne cocktails when you’re out about town. Just download their app from the Google Play Store or the Apple App Store and search for “drinkone” in the drinks tab! Oh, and about those cocktails: THEY’RE FREAKIN’ DELICIOUS. Here, take a look at them (hover to see ingredients; click to embiggen). Then, drag your friends out to help you drink some! And if you can’t make it out to any of our events or bars, remember you can still donate here. Cin cin! 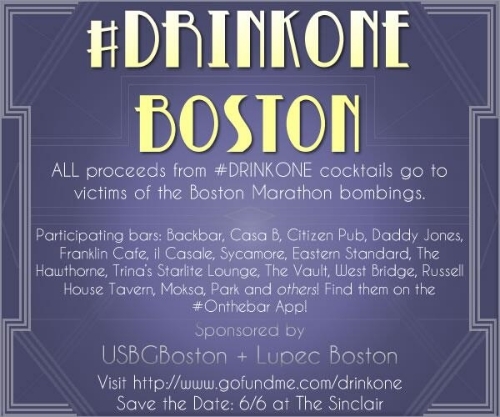 Enjoy a DrinkOne cocktail at any of the following locations: Backbar, Citizen, Franklin Cafe, Franklin Southie, The Hawthorne, Trina’s Starlite Lounge, Il Casale, The Sinclair, Russell House Tavern, The Vault, West Bridge, Sycamore, Daddy Jones, Park, Casa B, Moksa, Silvertone, Eastern Standard, Fuji. DrinkOne cocktails are made possible with generous support from Fire Puncher Vodka, Brugal, Pierre Ferrand 1840, Cutty Sark, Reyka, Drambuie, GTD Wireworks Gin, Sailor Jerry, Hendricks, Jack’s Abby, Citadelle, Punt E Mes, Four Roses, Drambuie, Plantation 5 Year Barbados, Bacardi, Damrak, Four Roses, and J. Lohr wine.